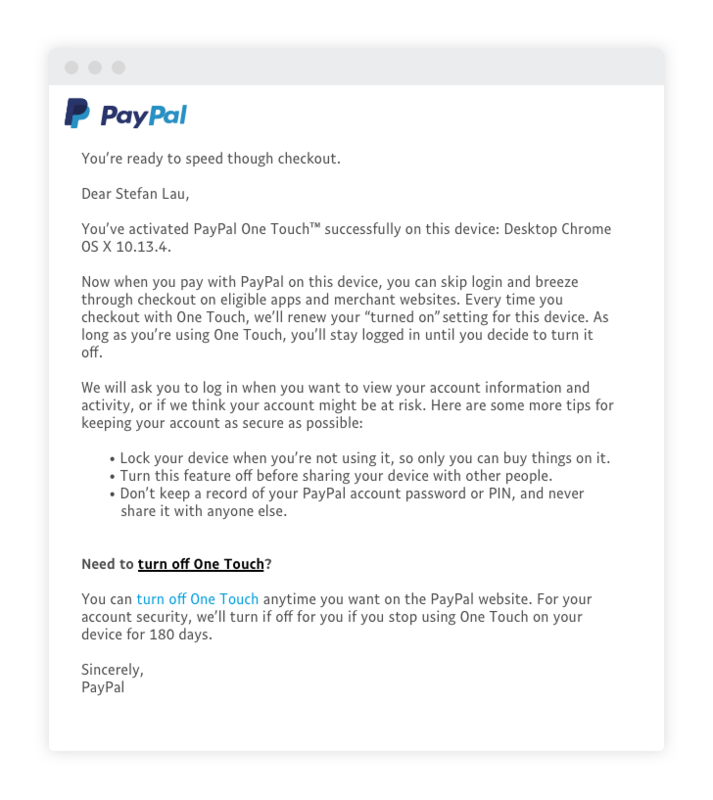 One Touch™ is one of the features PayPal users tell us is one of their favourites. 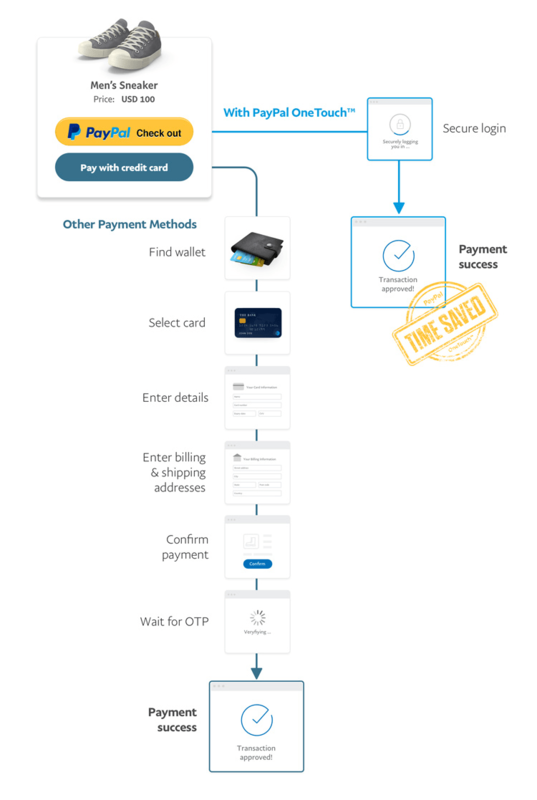 Activating this opt-in allows you to shop, review and pay without needing to type in your financial or account details, as PayPal remembers your preferences and verifies your identity automatically. What’s more, you’ll still enjoy the same Buyer Protection# and refunds on return shipping* for eligible purchases. Opting in for One Touch™ is easy and can be done in a few clicks. Activating One Touch™ can be done during checkout by logging into your account to verify your identity. To avoid misuse of your account, it’s best to only activate this feature on your personal device or computer. We’ll send you an email to confirm your opt-in. And that’s it — you don’t have to do anything else! Remember, you can choose to turn off One Touch™ at any time you wish. We will also turn it off automatically if you stop using it for 180 days as an extra precautionary measure to keep your data safe. Why should I activate One Touch™? Activating One Touch™ saves you the hassle of entering your login details whenever you shop online. As payment is done through PayPal, PayPal’s protection of your financial data still applies, as well as Buyer Protection# and refundable return shipping* for eligible purchases. Does it work across all devices? Yes. Once you’ve opted in for One Touch™, you can breeze through checkout for that specific device and browser for 6 months. If you’d like to have the same for your other devices, you just need to do the same opt-in when checking out on that device or browser. How does PayPal help protect my financial account information when using One Touch™? We never share full payment information with the stores you shop on, and monitor transactions closely for any possible frauds or unusual activity. To be extra secure, we’ll ask you to log in again whenever you update your PayPal account details or your financial information. This way, we can make sure it’s you and not someone else using your account. I still don’t feel safe checking out with One Touch™. If you wish to deactivate it at any point, you can turn it off from your account profile at any time. The opt-in is always there for you when you feel ready. What if the account is not mine? If you’re shopping from a mobile device that is not your own, simply click on the Not Me button to log out. Using someone else’s account to purchase something means that you’d be making an unauthorised payment. Where can I use One Touch™?